Reference number for this case: 9-oct-54-Pournoy-La-Chétive. Thank you for including this reference number in any correspondence with me regarding this case. Three children of Pournoy-La-Chétive claim to have seen an odd machine and curious small man who talked to them. Three children of Pournoy-la-Chétive have just affirmed to have seen in the evening of Friday an odd machine going down from the sky and a strange small man coming out of it, and talk to them. Such is the news which spread in the villages of the Seille. "In the sky, we saw something luminous. It was a round machine of 2 m 50 of diameter approximately, which landed a little in front of us. The apparatus had black, yellow and white stripes and rested on 3 feet. We awaited 1 minute or 2 and a man came out of it. He had a lamp lit in a hand, a lamp which launched rays, and in the other hand, a luminous object in the shape of a cross. The man had large eyes, a hairy face was very small, 1 m 20 perhaps. He was deessed of a black dress, like a priest. He stared at us in the eyes. We were afraid, but we could not move. He said something in a language that we did not understand. When he extinguished his lamp, we run away. After, we saw something luminous in the sky which went away very quickly." And Gilbert Calba added: "is not to be noticed that I say that, but I swear to you that I saw it..." Another inhabitant of Pournoy, Robert Maguin, aged 15, also saw, it seems, the mysterious machine, in the sky. Such is this curious relation which leaves perplexed. For its part Mr. Delacour, the sympathetic Mayor of Pournoy, hesitates to decide: "I tell you frankly, I do not believe too much in the flying saucers... I am a little like Saint Thomas... But after all, there could have something to it." As for Mr. Léonard, the devoted secretary of the Town hall, he only comes only Saturdays and, in the present case, he is satisfied to simply doubt... Perhaps the future will tell if the 3 children were the toys of a too wild imagination. Because he had seen a flying saucer he gets it! Stories of saucers, definitely, are quite disconcerting and are nowhere near to stop causing impassioned comments. Those "which see some" are die-hard believers and are obviously showing their anger at skeptics septic who meet them a tat mockingly. That's because one needs to understand the psychology of those "who do not see any." It enters in their behavior a certain amount of spite and they are "believers" in waiting. They adopt, while waiting, the wise attitude of Saint Thomas. If up to now, the flying saucers, luminous soup tureens, cigars, half-cigars and other acrobatic objects posed multiple enigmas, they did not cause a damage however, except in the cerebral balance of certain witnesses who have not yet recovered of their emotions. But we know a 11 year old young boy who happens to be the the victim of the flying saucers. The fact of having seen one of them and to have said it, earned him paternal physical punishment in due form. The poor kid will remember his "saucer." It is in Pournoy-la-Chétive, in the Moselle, that the incident occurred. Since 24 hours, this small village located at 20 km of Metz, is divided in 2 camps: those which are for the flying saucers and those... who gently laugh. At about 08:00 P.M., Friday, a 11 year old kid, the young Calba, returned hastily to his parents telling, breathlessly, that he had just seen a flying saucer. His father, unconvinced, raised the hand and, so that in the future the kid does not tell any more crap stories, made his taste for saucers pass. However, in spite of the paternal argumentation, the child persisted in his account, even adding that 2 of his comrades had also seen the saucer. It was when the 3 children were rollerskating, at a few hundreds of meters of the village, that the "thing" occurred. They saw a circular machine, projecting a dazzling light. The machine landed on the roadside and the kids claim that a small man, measuring approximately 1 m, dressed in black and with a hairy face had descended from the saucer. The children were seized by fear, a general stampede followed and they returned to their home at all the speed their legs could provide and likely on their rollerskates. Interrogated separately, the 3 young boys made an identical statement and affirmed that in Pournoy, several adults have also seen the saucer — but without the bearded pilot. of orange color, having the shape of a disc approximately 5 m in diameter. After having descended down until some ten meters above the ground, the machine, that the 2 witnesses claim to have been a "flying saucer," went up suddenly vertically to disappear shortly thereafter. This phenomenon has been sonformed by several other people working with [the factory] Sidelor who saw, at the same time, a strange gleam on the side of the river Orne. Since Saturday, the inhabitants of the small community of Pournoy-la-Chétive, close to Verny (the Moselle) have been divided in two clans: those who believe in it and those who laugh at it. We are talking about the flying saucer, of course. Three children of the village claim, indeed, that they saw a saucer and his passenger. They told their story toh their parents, repeated it in front of the teacher and confirmed in front of Mr. the Mayor. All three were rollerskating near the cemetery. There was: Gilbert Calda, aged 12; Daniel Hirsch, aged 9; his brother Jean-Pierre, aged 5. [...] states Gilbert, we saw a luminous and round machine of 2 m 50 approximately of diameter land. The craft landed close to us: it had yellow and white stripes and was posed on three feet. "Soon, a man came out of it holding a flashlight in the hand. "He was very small (1 m. 20 approximately) had large eyes, a hairy face and wore a black cassock like Mr. the Priest. The man came to speak to us in an incomprehensible language, and we fled, frightened." "We turned ourselves back a little further. The machine, very shining, rose very high and very quickly in the sky." This account is partially confirmed by another resident of Pournoy-la-Chétive, Robert Maguin, aged 16, who stated to have seen, also around the same hour, a mysterious machine but he was not close enoughto distinguish its details. In a previous article, we had reported the statements of children who had seen, in Pournoy-la-Chétive, a "flying saucer" and a small man dressed in black. Since this day, the population had lived in fear of new appearances and locked up twice at nightfall. A discrete investigation, having been carried out, made it possible to identify the so-called "Martian" who is no other than an inhabitant of the locality. Indeed, the latter being retained that day by his work, had not been able to go for grass for its rabbits before nightfall. Whereas he was at the exit of the village, close to the cemetery, and on the return way, he had to make use of his flashlight several times. Children playing in the vicinity were sized by fear and fled all trembling to the residence of their parents, in spite of the vain words of the "Martian", who tried to make himself be recognized. As for the flying saucer, no doubt that it was also pure imagination. Paris, Oct. 16 -- The skies of France are as crowded with flying saucers this fall as Times Square is with people on New Year's Eve. Squadrons of saucers, plates and soup tureens - in fact, practically the whole crockery family - are zooming through the atmosphere and occasionally landing in a friendly manner near schoolchildren, railway workers, farmers or even sailors at sea. For many years the French knowledge of these foreign elements was only from scattered reports of far-off countries where they had been seen. At long last, this unhappy situation has been corrected and for the past months, all French newspapers have opened special daily columns to dozen of French citizens who give detailed accounts of their strange encounters with people from another planet. While the whole world is still wondering about the mystery of the flying saucers, the French have solved the problem. In their minds there is no question that this foreign craft is coming from Mars and, judging by the newspapers, you have to be almost unsociable nowadays to miss running into one of these Martian gentlemen here while taking an afternoon stroll. In other countries, everyone has talked about vague luminous balls circling through the skies, but in France more is known about them because they come down (preferably on railroads) and hang around for a while, letting you have a good look. It is probably that in going over France and recognizing Paris from far away, Martian pilots cannot resist landing to get a close view of the Eiffel tower and the French girls. At least this is the way the French like to interpret it. In this vein, the most detailed reports about flying saucers and their occupants are originating here. For instance, Bernard Goujon who lives in Coulommiers, a western suburb of Paris, to take one of the testimony out of thousands gathered by the gendarmes - did not believe in their existence until a few days ago. He is a 30-year-old highway engineer in good health and apparently normal without any unusual complexes. Last Thursday, while on the road with a co-worker, Armand Picket, a shiny object landed in a field half a mile from them. "I ran toward the saucer that looked as if it were made of aluminum and about 25 feet wide. Resting on a sort of tripod, it looked like a big mushroom. On top was a cockpit with three round windows. As I got about 100 yards from it, something stopped me. I couldn't move forward or backward, and I had a strange tingling sensation throughout my body as if I had received an electric shock. "I was stuck to the spot some 30 or 40 seconds while the ship went up, started circling on itself and suddenly took off like lightning through the clouds." Poor Goujon probably had to deal with some shy Martians. Many other Frenchmen were more lucky than he. According to them, the Martian is not very attractive, averages 5 feet in height, has a very thick, bearlike beard all over his face, wears a pointed glass helmet and does not speak any of our languages. All in all, he looks pretty much like the caricature of him made by cartoonists all over the world. Three children in the village of Moselle (noted for its wine), in eastern France, have even seen one dressed like a priest - with a hairy face too. He talked to them, but they could not understand him. To add support to their stories, French newspapers recalled that - according to American sources - one of these travelers has been captured in the United States. He is kept in an incubator at the Pentagon, where intelligence officers are trying to teach him basic english. "But is not easy," they claim. In general, the French public accept the flying saucer with light irony - like other things. However, police and national scientists had started the difficult job of veryfying the hundreds of testimonies that have poured in from all over France in an attempt to separate pure fantasy or hallucination from objective facts. Their position is that in the interest of science, one must keep an open mind on such matters - such is the official attitude. This is especially true since the French have noticed that as soon as flying saucers begin appearing over French skies, the Russian press published a multitude of articles on soviet progress in building space ships designed to go the moon "in a relatively near future." Is it pure coincidence? Collective hallucinations are one thing - the public and the press may have fun with them - but politics and science are another - and governments have to keep their eyes open. The author indicates that on October 9, 1954 in Pournoy-la-Chétive in the Moselle, a saucer landed close to the cemetery while three children, Gilbert Calda, 12-year-old, Daniel Hirsch, 9-year-old, his brother Jean-Pierre, 5-year-ld, had fun roller-skating. Towards 06:30 p.m., we saw a luminous and round machine of 2 m 50 of diameter land. The apparatus landed very close to us; it had yellow and white stripes and was posed on three feet. Soon a 'man' came out of it, holding in his hand an 'electric flashlight'. He was very small - 1 m 20 approximately - he had large eyes, a hairy face, and carried a kind of 'black cassock like Mister the priest'. The man came to talk to us in an incomprehensible language and we fled, frihtened. We looked back a little further. The craft, very shining, rose very high and very fast in the sky." Jimmy Guieu adds that another resident of the village, Mr. Robert Magnin, 16-year-old, saw the spacecraft during its rise. He comments that truth comes out of children's mouths and that th story must thus be believed because it could not have been invented as the precise details are the same as in hundreds of other descriptions. He gives as detail of these alleged correspondances that the flashlight is not a flashlight but probably a nonfatal defensive weapon used to project a paralysing ray. "We were roller-skating when a brilliant and round machine landed very near from us. A sort of 1,20 m tall man came out of it, dressed in a black bag resembling the cassock of Mr. the Priest. He had a hairy head and large eyes. He told us things we did not understand and we fled. A little further we stopped to look. The machine was going back to the sky at full speed." Aimé Michel adds that another villager at a few hundreds of meters from there also claims to have seen this machine which went up in the sky at full speed, and that Jimmy Guieu reports this case in his book Black Out sur les Soucoupes Volantes, 1956, Fleuve Noir publisher page 192. Michel Carrouges indicates that in the Calba observation words were spoken to the witness by the saucer's pilot. The authors say that a round machine was seen in 1954 at about 06:30 p.m. in Pournoy-la-Chetive (Moselle), France, according to four children. They told authorities that they had been roller-skating when they saw something bright near the cemetery. They approached and found that it was a round machine, about eight feet in diameter, standing on three legs. A little man, about four feet tall came out of it. In his hand he held a light of some kind which blinded the children. They said they saw that the creature had large eyes, a hairy face and was dressed in a "sort of black sack." The creature, the children reported, spoke to them but they could not understand what it said. Then it turned off the light it held. The children became frightened and ran away. When they overcame their fright sufficiently to look behind them, they saw something which was very bright flying through the sky at great speed. The authors indicate that on October 9, 1954, three kids were roller-skating in the village of Pournoy-la-Chetive in the Moselle, France, and later claimed that a round shiny machine landed quite close to them, and that a "kind of man" came out of it, about four feet tall, dressed in a black sack or cassock. The kids said that the little man's head was hairy and that he had big eyes and that he talked to them in a language which they did not understand. The kids became frightened and ran away. When they stopped and looked back, the machine was ascending into the sky at high speed. The authors add that the sighting of the craft rising in the air was backed by another villager. The strange sigthing of three youg children of the village of Pournoy-La-Chétive. It is 6:30 p.m. when Gilbert Calda, Daniel Hirsch and Jean-Pierre Hirsch were roller skating. Suddenly, they saw a gleam close to the cemetery. It was a round machine of a diameter of 2 meters 50, of metallic color, shining, posed on the ground on three tripods. A being of small size was to come out of it, measuring approximately 1 meter 20, dressed in black, the face covered of hairs, with large eyes. The being approached the children, holding in his hand a source of light which dazzled them, uttering some words in an unknown language. Frightened, the children escaped, and turned back to see the object, which was now high in the sky. Another witness of the scene, Robert Magnin, then aged 16, observed the phenomenon from a distance. "We were roller-skating, at approximately 06:30 p.m., when suddenly we saw something luminous close to the cemetery. It was a round machine, of approximately 2 m 50 of diameter, which stood on three legs. Soon, a man came out. He carried a lit lamp in the hand and it dazzled us. But we could see that he had large eyes, a face covered with hairs, and that he was very small, approximately 1 meter 20. He was dressed of a kind of black bag like the cassock that the Reverend wears. He looked at us and said something to us that we did not understand. He extinguished the lamp. We were afraid and we ran away. When we looked back, we saw something in the sky: it was very high, very shining, and it was flying fast." The two authors indicate that to Pournoy-la-Chétive in the Moselle, on October 7, 1954, at 06:30 p.m., according to a dispatch of the A.F.P. and their personal file, children of the village, Gilbert Calba, aged 12; Daniel Hirsch, aged 9; his brother Jean-Pierre, aged 5, were rollerskating close to the cemetery, when their play was stopped by the arrival of a luminous craft which came to land very close to them. According to the indications given by the children, in particular Gilbert, its diameter was estimated as of 3 meters. By comparison with the size of Gilbert, the being measured approximately 1,20 meter. "It had yellow and white stripes. It was posed on three feet. A small being came out of there. It had large eyes, a hairy face and a kind of cassock "like Mister the Priest". It wanted to speak to us, but its language was incomprehensible. We became frightened. We ran away. We turned nack a little farther. The craft, very shining, rose very quickly and very high in the sky." The authors note that if there had been only the account of these three children, many would have doubted it, but another resident of Pournoy, Robert Magnin, attended the display partially, but from too far to distinguish the details. "We talked with Gilbert Calba and also his playmates, which saw only saw a large shooting star." The authors indicate that with Pournoy-la-Chétive, on October 9, 1954 at 06:30 p.m., Gilbert Calda, 12-year-old, Daniel Hirsh, 9-year-old and his brother Jean-Pierre, 5-year-old, were roller-skating close to the cemetery when they saw landing very close to them a luminous and circular machine, three meters in diameter, which had yellow and white stripes and rested on three feet. A small being came out of it, it was 1.20 meters tall, with a hairy face, large eyes, and wearing a black cassock "like Mister the priest", according to the three children. He held a kind of flashlight in a hand. The being spoke to the children in an incomprehensible language, the latter became frightened and run away, and when they looked back they saw the shining craft rise in the sky. Mr. Robert Magnin, 16-year-old, sees this but too far for seeing details. The authors indicate that their sources are Aimé Michel in "A Propos des S.V." page 192; C. Garreau and R. Lavier in "Face aux ET" pages 102-103 with the date of October 7; Jimmy Guieu in "Black Out sur les S.V " pages 203-204; and "Quincy". At 07:30 p.m., three children: Gilbert Calba (12 years old), Daniel Hirsh (9 years old) and his little brother Jean-Pierre (5 years old) play roller-skating on the D 41 at the entry of the cemetery. Suddenly, a light falls from the sky in front of them, a round machine of 2,50 m diameter lands. The apparatus has black, yellow and white stripes and rests on three feet. A 1,20 , tall little man, dressed of a black dress like a priest, comes out after two minutes. The stranger has large eyes, a hairy face and he carries in a hand a lit lamp which launches rays and in the other hand a luminous object in the shape of a cross. He stares intensely at the frightened boys who cannot move any more. He pronounces incomprehensible words then turns ofh his lamp; at once the children flee. Further away, they look back and see something luminous go up very quickly in the sky. 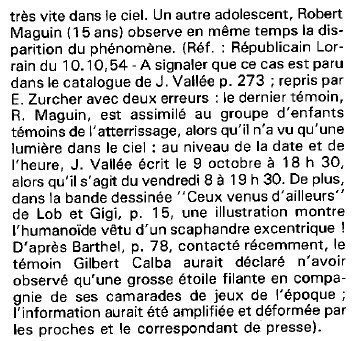 Another teenager, Robert Maguin (15 years old) observes at the same time the disappearance of the phenomenon. (Ref. : Républicain Lorrain for 10.10.54 - It must be noted that this case appeared in the catalogue by J. Vallée p. 273; used again by E. Zurcher with two errors: the last witness, R. Maguin, is said to be with the group of children who witnessed the landing, whereas he saw only a light in the sky: about the date and hour, J. Vallée writes 9 October at 06:30 p.m., whereas it was Friday 8 at 07:30 p.m.. Moreover, in the comic strip "Ceux Venus d'Ailleurs" by Lob and Gigi, p. 15, a sketch shows the humanod dressed in an eccentric diving-suit! According to Barthel, p.78, contacted recently, the witness Gilbert Calba would have stated to have observed only a large shooting star in company his playmates of the time; the information would have been amplified and distorted by the relatives and the press correspondent). "It was a round machine, about 2.5 meters in diameter, which was standing on three legs. Soon a man came out. He was holding a flashlight in his hand and it blinded us. But we could see that he had large eyes, a face covered with hair and that he was very small, about four feet tall. He was dressed in a sort of black sack like the cassock M. le Curé wears. He looked at us and said something we did not understand. He turned off the flashlight. We became afraid and ran away. When we looked back we saw something in the sky: it was very bright, very bright, and flew fast." While at play, four French children noticed an odd light. A quote from a press account collected by Jacques Vallee says: "It was a round machine, about 2.5 meters in diameter, which was standing on three legs. Soon a man came out. He was holding a lighted flashlight in his hand and it blinded us. But we could see that he had large eyes, a face covered with hair and that he was very small, about four feet tall. He was dressed in a sort of black sack like the cassock M. le Cure wears. He looked at us and said something we did not understand. He turned off the flashlight. We became afraid and ran away. When we looked back we saw something in the sky: it was very high, very bright and flew fast." 91. 91. Vallee, Jacques. Passport to Magonia. p.54. 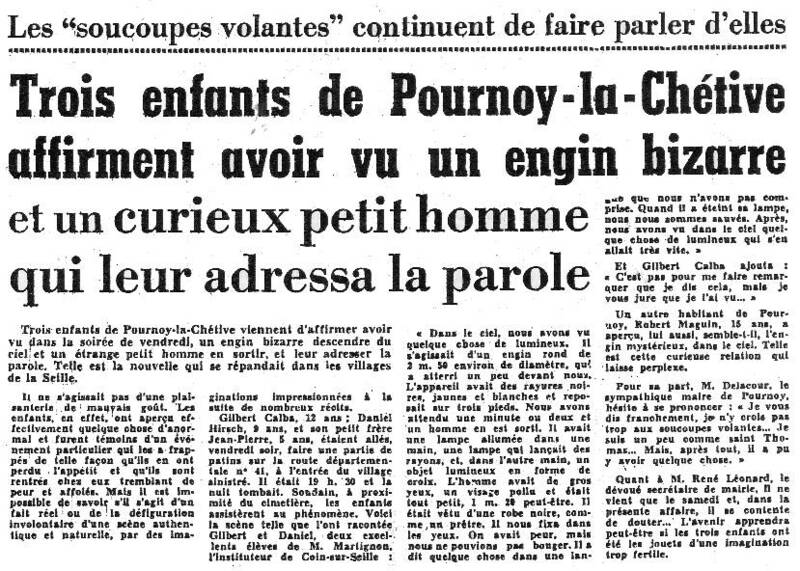 At Pournoy-La-Chétive, in Moselle, on October 9, 1954, four children, Gilbert Calba, 12 years and the oldest, Robert Maguin, Daniel Hirsch, and Jean Pierre Hirsch, reported a UFO phenomenon. The sight of an occupant at the time was allotted to the presence of an inhabitant who collected grass for the rabbits while using a flashlight, which would have deceived the children. French ufologist Jean Sider explains that he carried out a counter-investigation: he went to Pournoy-La-Chétive on June 22-23, 1989 to meet the witnesses there. Gilbert Calba initially did not want to confirm the observation, refusing to speak about it. After insistence of Jean Sider, he admitted that he had seen a moving source of light in the sky which he could not identify. Jean Sider had the strong impression that this witness did not want to speak any more about the events. A few days later, Jean Sider ended up discovering an article on page 5 of the regional daily newspaper "La Lorraine" of October 11, 1954 [Ref. ll1:], where it is said that the father of Gilbert Calba severely punished his son for having spoken about his sighting all around in the village. Sider could not meet Daniel Hirsh, who however confirmed his observation in a telephone conversation with the ufologist Christian Jay. Jean Pierre Hirsch still remembered to have seen a non dazzling white-blue light, which went down punctually towards the ground. He did not see occupants but claimed that the place of the alleged landing remained visible during a dozen years because the grass, according to him, did not grow back there. He specified to Jean Sider that the people in the village mocked them badly, and that it had deeply affected Gilbert Calba, who was the oldest of the group (aged 12) and thus the "chief" of their group. Robert Maguin, who was furthest away from the other 3 witnesses, confirmed the presence of a luminous phenomenon that he still could not explain, but was reluctant to speak about the incident. Jean Sider asked each witness if they were actually contacted by Gerard Barthel and Jacques Brucker, as they claimed, and he learned that they had only contacted Gibert Calba by phone. "In the worst case, the occupant is maybe a confusion, even if its description does not correspond to anybody in the country (and it doesn't by far) but there was at least a CE2 at Pournoy-La-Chétive, with a possibility of CE3." Elsewhere in his book, Jean Sider indicates that the counter-investigation by Barthel and Brucker is "imaginary". The Belgian ufologist indicates in her catalogue that in 1954, on October 9, in France in Pournoy-la-Chétive, in the Moselle, "3 children who were skating towards 18:30, Gilbert Calda, Daniel and Jean-Pierre Hirsch, close to the cemetery, see an object landing very close to them. The object was close to the cemetery posed on 3 crutches, it had a diameter of 2,50m approximately. A dwarf of approximately 1,20m dressed of black, the face covered of hairs, large eyes, left while directing at them a dazzling light and pronounced some words in an unknown language. The children looked back in time to see the object flying away. Robert Magnin, aged 16, observed the display from a far away place." The sources are indicated as "France-Soir, 12 Oct 1954" and "M. FIGUET/ J.L. RUCHON: 'Ovni, Premier dossier complet...' Alain Lefeuvre pub. 1979, p. 137" and "Jacques Vallée: 'Chronique des apparitions ET' - DENOEL 1972 - J'AI LU COLL. - p. 273". Jean-Paul Ronecker mentions this case as exemple for his category of extraterrestrial beings of type "hairy dwarf." He indicates that on October 9, 1954, Gilbert Calda, aged 12, Daniel Hirsch, aged 9, J.-P. Hirsch, aged 5, Robert Manguin, aged 16 are the witnesses, all kids of Pournoy-la-Chétive. "We were roller-skating, at approximately 06:30 P.M., when suddenly we saw something luminous close to the cemetery. It was a round craft, approximately 2,50 meters in diameter, which was on three feet. Soon, a man came out. He carried a lit lamp in the hand and it dazzled us. But we could see that he had large eyes, a face covered with hairs, and that he was very small, approximately 1.20 meters. He was clothed with a kind of black bag, as the cassock which the priest is wearing. He looked at us and said something that we did not understand. He turned the lamp off. We were afraid and we run away. When we looked back, we saw something in the sky: it was very high, very shiny and it flew fast." The author indicates that in the Pournoy-la-Chetive Cemetery, on October 9, 1954, four children ranging in age from five years old to sixteen, were roller-skating by the cemetery near their homes in Pournoy-la-Chetive in France when they encountered a UFO that hovered directly over the graveyard and was described as round, luminous, and about three meters in diameter. All four witnesses watched in shock as a short figure appeared. It was dressed in black, had large eyes, and hair on its face. It shone a "blinding light" at them, and spoke in an "unknown language." The four young witnesses fled in terror, but turned around in time to see the object take off and fly away. Four children saw a bright glow from a nearby cemetery. Object about 8' diameter standing on 3 legs. Small creature carrying a bright light exited the craft & spoke to them, but they couldn't understand it. _UFOs The Whole Story_ adds that the occupant was about 4 FT tall and dressed in a black sack or cassock (like a monk--SJD). The little man's head was hairy and he had big eyes. 1954 - Pournoy-la-Chetive, France. Four children--Gilbert Calda, age 12; Daniel Hirsch, age 9; J. P. Hirsch, age 5; and Robert Maguin, age 16--were roller skating at 6:30 p.m. when they saw a luminous object near the cemetery. It was round, about 2.5 meters in diameter, on stood on three legs. A dwarf, about 1.2 meters tall, dressed in black, having a face covered with hair and large eyes, came out and shone a blinding light at them. It said something in an unknown language. The children ran away, but looked back in time to see the object flying away high in the sky. (Sources: Aime Michel, Flying Saucers and the Straight Line Mystery, p. 154; Jacques Vallee, Passport to Magonia, p. 222). Gilbert Calda, 12, with 3 younger children, was roller-skating when "a round shiny machine came down very close to us. Out of it came a kind of man, 4-feet tall, dressed in a black sack like a cassock. His head was hairy, and he had big eyes. “He said things to me that we couldn't understand, and we ran away. When we stopped and looked back, the machine was going up into the sky very fast." October 9, 1954 Gilbert Calda, 12 Pournoy-la- Che live, (Moselle), France 6:30 P.M.
One 4-ft tall being, dark coveralls, large eyes; children roller-skating, shiny round craft landed near them, being emerged, made unintelligible sound; they ran away. Luc Chastan indicates in his database that in the Moselle in "Pournoy la chétive" on October 9, 1954 at 06:30 p.m., "3 children who were skating at approximately 6:30 p.m. near the cemetery, see an object landing very close to them. The object was close to the cemetery posed on 3 crutches, it had a diameter of 2,50m approximately. A dwarf of approximately 1,20m dressed in black, the face covered of hairs, with large eyes, emerged while directing on them a dazzling light and pronounced some words in an unknown language. The children looked back in time to see the object flying away. A teenager observed the display from far away." The website indicates that on 9 October 1954 at 18:30 in Pournoy-la-Chetive, France, there was a "Luminous object, 2.5 meters in diameter, and a dwarf, about 1.2 meters tall." The website adds: "Pournoy-la-Chetive, France . Four children--Gilbert Calda, age 12; Daniel Hirsch, age 9; J. P. Hirsch, age 5; and Robert Maguin, age 16--were roller skating at 6:30 p.m. when they saw a luminous object near the cemetery. It was round, about 2.5 meters in diameter, on stood on three legs. A dwarf, about 1.2 meters tall, dressed in black, having a face covered with hair and large eyes, came out and shone a blinding light at them. It said something in an unknown language. The children ran away, but looked back in time to see the object flying away high in the sky." And: "Four children-Gilbert Calda, 12; Daniel Hirsch, 9; J. P. Hirsch, 5; and Robed Maguin 16-were roller-skating when they saw a luminous object near the cemetery. It was round, about 2.5 meters in diameter, standing on three legs. A dwarf, about 1.2 meters tall, dressed in black, having a face covered with hair and large eyes, came out and shone a blinding light at them, and said something in an unknown language. The children ran away, but looked back in time to see the object flying away high in the sky." And: "An object was observed. Occupants of the craft were seen. One shiny ball, about 10 feet across, was observed by four male witnesses, typical age 12, at a cemetery for five minutes. One 4-foot-tall hairy dwarf, wearing a black robe, was seen." And: "Gilbert Calda, 12, with 3 younger children, was roller-skating when "a round shiny machine came down very close to us. Out of it came a kind of man, 4-feet tall, dressed in a black sack like a cassock. His head was hairy, and he had big eyes. "He said things to me that we couldn't understand, and we ran away. When we stopped and looked back, the machine was going up into the sky very fast."" The sources are indicated to be Webb, David, HUMCAT: Catalogue of Humanoid Reports; Guieu, Jimmy, Flying Saucers Come from Another World, Citadel, New York, 1956; Michel, Aime, Flying Saucers and the Straight-Line Mystery, S. G. Phillips, New York, 1958; Lorenzen, Coral E., Flying Saucer Occupants, Signet T3205, New York, 1967; Lorenzen, Coral E., UFOs: The Whole Story, Signet T3897, New York, 1969; Lorenzen, Coral E., Encounters with UFO Occupants, Berkley Medallion, New York, 1976, ISBN:425-03093-8; FSR, FSR (formerly Flying Saucer Review), FSR, London, 1966; Bowen, Charles, The Humanoids: FSR Special Edition No. 1, FSR, London, 1966; Pereira, Jader U., Les Extra-Terrestres, Phenomenes Spatiaux, Paris, 1974; Vallee, Jacques, Computerized Catalog (N = 3073); Vallee, Jacques, Challenge to Science: The UFO Enigma, Henry Regnery, Chicago, 1966; Vallee, Jacques, Preliminary Catalog (N = 500), (in JVallee01); Vallee, Jacques, A Century of Landings (N = 923), (in JVallee04), Chicago, 1969; Vallee, Jacques, Passport to Magonia, Henry Regnery, Chicago, 1969; Schoenherr, Luis, Computerized Catalog (N = 3173); Carrouges, Michel, Les Apparitions de Martiens, Fayard, Paris, 1963; Delaire, J. Bernard, UFO Register Volume 7 (1976), Data Research, Oxford, 1976; Newspaper Clippings; Hall, Richard H., The UFO Evidence, Volume II: A Thirty-Year Report, Scarecrow Press, Lanham, 2000, ISBN:0-8103-3881-8; Hatch, Larry, *U* computer database, Author, Redwood City, 2002; Rosales, Albert, Humanoid Sighting Reports Database. 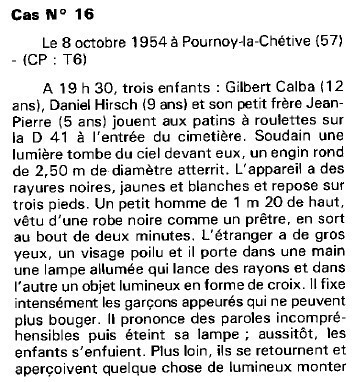 Four children, Gilbert Calda (12), Daniel Hirsh (9), Jean-Pierre Hirsch (5) and Robert Maguin (16) were roller skating when they saw a luminous object near the cemetery. It was round, about 2.5m diameter, and standing on three legs. A dwarf, about 1.2m tall, dressed in a black robe like the village priest and having a face covered in hair, and with large eyes, came out and said something in an unknown language. The children ran away but looked back in time to see the object flying away, high in the sky. A man also saw the object climbing. Vallee Case 220, citing France Soir 12 October 1954. Heiden citing Guieu 1956b, p.1979. *Oct. 9, 1954 - Pournoy-la-Chetive, France. Four children--Gilbert Calda, age 12; Daniel Hirsch, age 9; J. P. Hirsch, age 5; and Robert Maguin, age 16--were roller skating at 6:30 p.m. when they saw a luminous object near the cemetery. It was round, about 2.5 meters in diameter, on stood on three legs. A dwarf, about 1.2 meters tall, dressed in black, having a face covered with hair and large eyes, came out and shone a blinding light at them. It said something in an unknown language. The children ran away, but looked back in time to see the object flying away high in the sky. (Sources: Aime Michel, Flying Saucers and the Straight Line Mystery, p. 154; Jacques Vallee, Passport to Magonia: A Century of Landings, p. 222, case # 220). This database records this case 21 times! Witnesses are kids. Confusions favored by imagination and saucers talks of the time. [rl1] Article in the regional newspaper Le Républicain Lorrain, Metz, France, page 6, October 10, 1954. [de1] Article in the local newspaper Dimanche-Eclair, France, pages 5, October 10, 1954. [ll1] Article in the regional newspaper Le Lorrain, France, page 5, October 11, 1979. [lp1] Article in the regional newspaper Le Provençal, France, October 12, 1954. [rl2] Article in the regional newspaper Le Républicain Lorrain, Metz, France, October 13, 1954. [bs1] Article in the foreign newspaper The Baltimore Sun, Baltimore, Maryland, USA, page 15, October 17, 1954. [ss1] Article in the national weekly newspaper Samedi-Soir, Paris, France, 1954. [jg1] "Black Out sur les Soucoupes Volantes", book by Jimmy Guieu, Fleuve Noir publisher, France, pp 203-204, 1956. [am1] "Mystérieux Objets Célestes", book by Aimé Michel, Arthaud publishers, France, 1958. [lo2] "Flying Saucer Occupants", book by Coral and Jim Lorenzen, Signet Books publisher, USA, pp 94-95, 1967. [lo1] "UFO - The Whole Story", book by Coral and Jim Lorenzen, The New American Library publishers, Signet Books, USA, page 167, 1969. [jg1] "Black Out sur les Soucoupes Volantes", book by Jimmy Guieu, Omnium Littéraire publisher, France, pp 203-204, 1972. [am1] "A Propos des Soucoupes Volantes", book by Aimé Michel, reprint of "Mystérieux Objets Célestes", Planète publisher, France, page 192, 1972. [---] "Ceux Venus d'Ailleurs", comic book by Lob and Gigi, Dargaud publisher, France, page 15, 1973. [gl1] "Face Aux Extra-Terrestres", book by Charles Garreau and Raymond Lavier, Delarge publisher, J'ai Lu, France, pp 102-103, 1975. [am1] "Mystérieux Objets Célestes", book by Aimé Michel, Seghers publishers, France, page 210, 1976. [---] "Catalogue of Humanoid Reports", compiled by David Webb and Ted Bloecher, CUFOS, USA, circa 1978. [bb1] "La Grande Peur Martienne", livre par Gérard Barthel et Jacques Brucker, Nouvelles Editions Rationalistes, France, page 78, 1979. [fr1] "OVNI - Premier Dossier Complet Des Rencontres Rapprochées en France", book by Michel Figuet and Jean-Louis Ruchon, Alain Lefeuvre publisher, France, page 137, 1979. [jv7] "Dimensions - A Casebook of Alien Contacts", book by Jacques Vallée, Souvenir Press publishers, U-K, page 78, 1988. [lg1] "The Fifth Horseman of the Apocalypse - UFOs: A History - 1954 October", monography by Loren E. Gross, USA, pp 23-24, 1991. [---] "Faces of the Visitors", book by Kevin Randle and Russ Estes, Fireside publishers, USA, page 267, 1997. [js1] "Le Dossier 1954 et l'Imposture Rationaliste", book by Jean Sider, Ramuel publisher, France, page 20, pp 21-22, 1997. [---] "The UFO Evidence, Volume II: A Thirty-Year Report", book by Richard H. Hall, Scarecrow Press publishers, USA, 2000. [pd1] "Is there a connection? - UFOs and cemeteries", article by Preston Dennett, in the ufology magazine MUFON UFO Journal, Mutual UFO Netwouk (MUFON), USA, #410, page 4, June 2002. 0.1 Patrick Gross March 7, 2003 First published. 1.0 Patrick Gross March 8, 2009 Conversion from HTML to XHTML Strict. First formal version. Additions [fr1], [dj1], [go1], [pd1], [lc1], [ud1]. 1.3 Patrick Gross July 3, 2010 Addition [jv7]. 1.4 Patrick Gross July 7, 2010 Additions [ri1], [fb2], [sd1]. 1.5 Patrick Gross 18 août 2010 Addition [rr1]. 1.6 Patrick Gross 21 octobre 2011 Addition [lo2]. 1.7 Patrick Gross 30 octobre 2011 Addition [jb2]. 1.9 Patrick Gross October 8, 2014 Additions [ni1], [ta1]. 2.0 Patrick Gross December 8, 2016 Additions [in1], [ub1]. 2.1 Patrick Gross December 20, 2016 Addition [lg1]. 2.2 Patrick Gross February 11, 2017 Addition [bl1]. 2.3 Patrick Gross September 21, 2017 Addition [bs1].